Andrew Stanton first conceived the idea for Wall-E way back in 1994, but didn't really know how to develop the story. With other projects on the go, he let it linger for years, and didn't take another serious crack at the script until 2002. Just for a second, imagine just what might have happened if Douglas Adams had been asked to take a crack at it in the meantime, only to have his darker, weirder, more mature take on the script be shelved upon his death in 2001. Now, imagine if you will, that a strange writing chap by the name of Jayde Ver Elst got his hands upon that version of script, loved the direction, but decided to make a few changes of his own - such as exchanging the cute little robot for a stuffed bunny, replacing Eve with a very Marvin-like love android, putting a tragic spin on the love story at its heart, and dropping the entire last act where humanity returns to reclaim the Earth. That gives you a good introduction into the world of Usu . . . but it actually gets weirder and more delightful. That's about all I will say about the plot, because it's not something that can be described. Distilled like that, it sounds simple and generic, but experienced through the narrative of Jayde Ver Elst it's complex, entertaining, and surprisingly emotional. As you might expect, there is a great deal of Douglas Adams and Monty Python style humor to be found here. How you react to the narrative depends on how much you enjoy those influences. This is an author who constantly breaks the fourth wall to talk to the reader, often to point out how he's about to make use of a cliched plot device, almost becoming a character himself. If you like that kind of approach, it's quite clever and amusing, and works well to explain the actions of a stuff rabbit who cannot speak for himself. If that sounds like an annoying sort of taboo . . . well, give it a shot anyway and prepare to be surprised. Despite the comic narrative and the absurdities of the plot, this is also the story with a heart and a soul. The more we learn of Usu, Rain, and what's come before, the more we share in their melancholy sorrow and desperate need to answer the cruelties of fate. Yes, it's a story of stuffed bunnies, sentient (sometimes crazy) robots, holograms, electronic cannibals, and post-apocalyptic landscapes. Yes, it's a story of fourth-wall humor, horrible puns, slapstick disasters, and nonsensical diversions. Beneath all that - actually, entwined in all that - however, is a story about love, friendship, memories, and the meaning of life. I wasn't sure what to expect after the first chapter. I wasn't sure if I was amused or annoyed. I'm glad I stuck with it. Usu is a very funny, very clever book that sets out to accomplish what it's author set out to do, and which (most importantly) doesn't overstay its welcome. 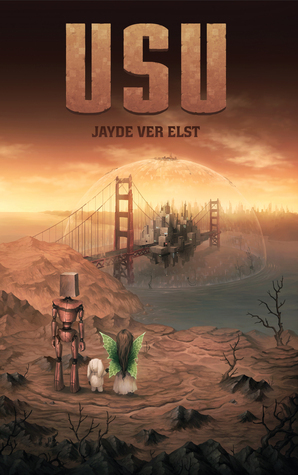 It's a short read, somewhere between a novella and a novel, but Jayde Ver Elst makes every scene - indeed, every word - count. While I'm not a Douglas fan, I do like Monty Python. Might have to give this a shot when it comes out. I may check this one out. As unsual as it may be, I cannot help but thank you sincerely for a review filled with compliments I'm not sure I'll ever deserve. Adams ruled my childhood more than textbooks and the Pythons have always been olympic idols in my eyes. You good sir, have humbled this author!